Most of my money has been invested in the stock market. But occasionally, I invest in myself. Honestly, I think I should invest more money in myself and my business but my frugality often gets in the way. And, while I rarely hesitate to spend on my children (for summer camps, enrichment programs, musical instruments, sports gear, and college education), I tend to ponder and over-think investments in me. In addition to my general reticence to spend money, I am often unsure of what investments will pay off. So, while I have come to realize that it’s okay to spend money on me, I still struggle with determining whether an expense today will yield results tomorrow. Still, fortunately, there are notable examples of investing in myself that have reaped benefits, both tangible and intangible. But today, I am still riding and this purchase has paid off in ways that I never imagined. For starters, I am in better physical shape now than I was years ago; and I have friends in their 60s and 70s who give me confidence that I can enjoy rigorous physical activity for much of my life. Along the way, I have learned to overcome fear and anxiety as I have become accustomed to riding on the road with gas-powered vehicles, other cyclists, and dogs who occasionally dart out and chase me. Sure I still get scared but I have learned that playing it safe doesn’t guarantee anything (except that life is boring without any risk). Just as significantly, I have an entire new set of friends. I have cycling buddies who crave time in the outdoors, enjoy getting better for its own sake not simply to crush the competition, care about their health, and love bonding over adventures. Before there were fitness trackers, there were GPS-enabled running watches. I got a Garmin Forerunner to track my pace and distance upon the recommendation of a friend, after I mentioned that I had trouble pushing myself on runs. I am not a gadget sort of person so buying this device was a big deal for me. The “watch” changed my training dramatically and I’ve dropped about 8 minutes from my 5K time, moving me from average to a frequent age-group winner or top 3 finisher. Again, this investment has benefited my fitness, health, and confidence. My parents paid for my college education but I have funded after-college studies, such as community college courses and a graduate-level program in technology and communication. These have equipped me with new skills and allowed me to expand my ability to learn and think critically. In addition to formal training, I have also invested in educating myself through various means, such as attending conferences, reading books, and studying content in subscription-based newsletters. Education takes both money and time, so I carefully considered these investments. What I have found is that the payoffs aren’t automatic; I have to apply what I have learned! But generally I am able to work more efficiently, pursue new opportunities, and make better decisions as the result of my education. I could easily see travel simply as an expense. And though I know there is a trend in spending on experiences, not things, I can envision overspending in this category. Still, there are some trips that can be viewed as investments, not just in memories and bonding but in personal and professional development. For my kids, I have readily spent on summer camps, including educational ones for teens held in major cities; a wilderness trek with the Boy Scouts that cultivated outdoor and leadership skills; and an overseas mission trip that exposed my son to different cultures and better understanding of global issues. Though I have been more reticent to spend on myself, I am glad to have spent and/or invested in family and personal experiences. Together, we’ve traveled out west, giving the family a better appreciation for natural beauty in the world. We've also participated in an out-of-state cycling trip, helping my youngest to earn a merit badge and giving us all more resilience in dealing with new situations. I have participated in mission activities within my state, making me more aware of the value of simply being present in other people’s lives. And, coming this summer, the entire family will travel overseas (three trips total). These experiences will expose us to different cultures and situations, which can help my children in their careers plus give us new perspectives, which offers benefits from solving problems to bringing greater contentment. Currently, I am leading a small group at my church that is serving a couple of purposes. One is to guide the development of this ministry in terms of shaping its structure, defining and spreading its values, and developing leadership training. The second is more immediate and involves experiencing life in a small group, finding joy in knowing God and each other, and being known and loved for who we are. Though the cost is minimal to me, the time commitment is fairly significant. We meet weekly and are planning on doing some travel together to see how small groups operate at other churches, and integrating our learnings into our ministry plan. This investment of time and energy has just begun but has already reaped benefits, affirming to me that honesty, compassion, and friendships can transform lives. Admittedly, I have sometimes felt that I have invested in others who really didn’t care so much about investing in me. But this experience has been happily different as the people involved are committed and willing to grow together. 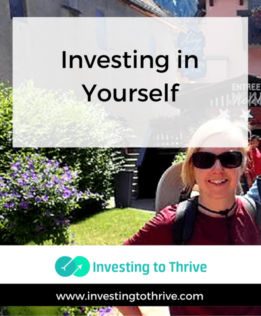 So, really, it's perfectly fine to invest in myself. I don't need to go overboard, borrowing heavily to finance graduate school that may not give me better insights, make me happier, or increase me income. But I should take advantage of opportunities to improve myself and my life.